Track Line Tyregrip – features – Track Line B.V.
Give cyclists the benefit of Track Line Tyregrip so they can ride in comfort and safety. Track Line Tyregrip – safe cycle lanes for years to come. Track Line Tyregrip is a long-lasting coating with an expected lifespan of 10 years. The coating is highly wear-resistant and can handle heavy and intensive traffic loads. Track Line Tyregrip maintains its non-skid surface quality. Even the effects of high-friction traffic on e.g. roundabouts are negligible. Track Line Tyregrip is UV-resistant and retains its colour throughout its service life to provide high visibility to all road users. The Track Line Tyregrip coating can be applied to new or existing asphalt. 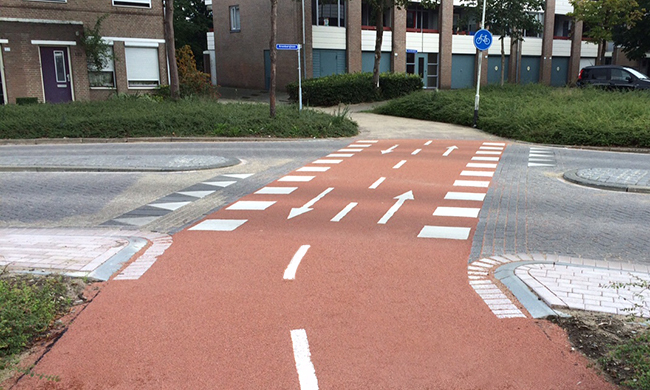 The use of a single coating creates a seamless transition between the main traffic and the cycle lane. This helps to prevent safety hazards. With Track Line Tyregrip you can be assured of a straight and safe cycle lane without any seams, splits or cracks. The processing time of Track Line Tyregrip is short, so cycle lanes can soon be back in service and roads can rapidly be reopened to traffic. Track Line Tyregrip is the perfect solution to create a professional finish to any other surface in addition to cycle lanes. The range of possibilities is endless. If you have any questions or would like to know more about the services we offer, contact us by phone or e-mail, and we will be happy to help you.